There are some unusual and dangerous antics going on with diet on the blogosphere including extreme interest in animal based ketogenic diets that are ultra-low in carbohydrates. There is a vocal group advocating meat only diets including those that suggest vegetables are unproven and may not be healthy! These radical approaches were given attention when Sean Baker, MD, an orthopedic surgeon, discussed his meat only diet on the popular Joe Rogan Podcast December 7, 2017 (episode 1050). Dr. Baker indicated that he had not checked any labs during the year he ate only meats. Whatever Dr. Baker’s labs reveal when ultimately checked, not all individuals respond well to diets high in fat from animal sources like meat and dairy. I recently saw a 55-year old athletic man who wanted a thorough check-up. He had no history or symptoms of heart disease. He was eating a diet moderately high in animal foods. He had a coronary artery calcium score done that revealed silent premature coronary artery disease (score of 185) putting him at risk for early heart attack. He brought me many reports from a reputable lab that tracked when he had adopted a meat and dairy ketogenic diet in mid-2015 (picture above). He checked his labs a few months later and was alarmed that his cholesterol had jumped over 100 mg/dl to 419. He decided to omit the dairy but stay on a meat only diet. He repeated his labs over the next months and his cholesterol rose to an unheard of 750 mg/dl. At this point he abandoned his nearly year long experiment, returned to a diet with some meats but over 90%A plant-based and his cholesterol fell to the lowest he had ever recorded. After that experience, he booked the appointment to see me and is now follow an integrative program to reverse his atherosclerosis using supplements, a whole food plant diet, stress management and continued fitness activities. In my nearly 30 years of the practice of interventional and preventive cardiology I have never seen a rise in cholesterol to the levels shown by this man from dietary changes. Unlike Dr. Baker, this man had enough concern to monitor his lab results and return to a healthier diet program when he tracked this scary result. 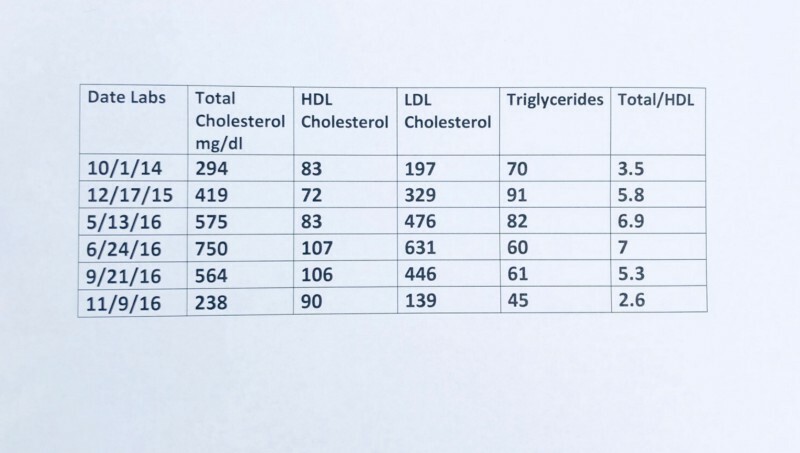 Although I would not advise it, if you are considering a diet heavy in meats and animal fats and low in “carbohydrates”, a program shown to increase mortality in many studies, at least monitor your cholesterol laboratory results. Additional clinical measures of endothelial function, insulin resistance, inflammation, TMAO, and IGF-1 should be assessed.